Texas has verbal commitments from six talented high school offensive linemen, but none more heralded then South Grand Prairie High's Tray Allen. 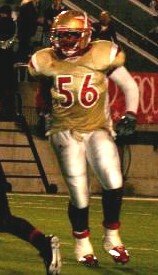 The five star Guard/Tackle is 6'4", 305 pounds, and really good at pushing people and knocking them down. With one look at his great frame, solid movement and fantastic tools, it's hard to think of a better offensive guard prospect in the nation than Tray Allen... Allen is not just quick but strong as he maintains a 350-pound bench press and 555-pound squat... Plus, Allen has yet to hit his ceiling and will excel even more in a college program where he looks to put on pounds and improve his already impressive athleticism. The sky is certainly the limit for Tray Allen. This highlights video is mostly from his junior year and it's a good one. At about a minute and a half into the clip, and then again at around 2:15, he knocks his guy down with some kind of axe-chop move. I don't know if that move's legal or not, but it makes me laugh evrytime. This video has been floating around the internet recently, filling Longhorn fans with hope and joy. His name is John Chiles, from Mansfield Summit HS in Arlington, TX. 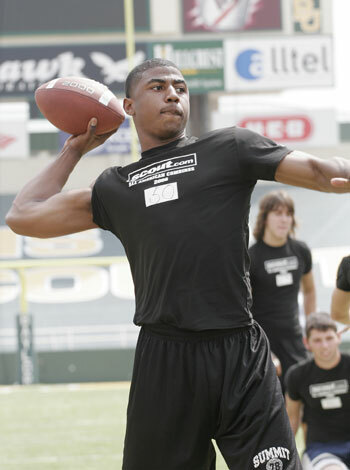 A 2007 QB/ATH recruit, Chiles committed earlier this year to play football with the Texas Longhorns and was recruited as a QB. But with QBs Jevan Snead, Colt McCoy and Sherrod Harris already on the team and the five-star John Brantley also committing to the Horns, the team is packed with top QB talent. Many think he'll end up at some other position to see earlier playing time, but just watch this video and try to count him out. Mansfield Summit quarterback John Chiles showed up at the camp and tested off the charts, running the third fastest time of the camp at a 4.39. Many wondered if Chiles would shine at the camp, because his style of play is better accentuated in a position where he can pull the ball down and run. However, with his off the charts test scores he showed his athleticism while proving that also had a killer arm. I don't know where he'll end up playing, but I can't wait. The night after winning the National Championship with the Longhorns, Vince Young was a guest on The Tonight Show. He seems relaxed telling stories and joking with a heartbroken Will Ferrell and the segment ends with a discussion about whether or not he'd go pro. 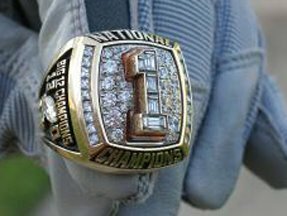 This clip is a time capsule or sorts--one of just four days when the Longhorns were National Champions and Vince was still a Longhorn. This clip includes the parts of the monologue and Will Ferrell's segment referring to the Rose Bowl, followed by Vince's complete appearance on the show. Trinity Catholic High School quarterback John Brantley has been named to the roster of the prestigious Elite 11, a camp/competition for the top quarterbacks in the country. Brantley will be the third Elite 11 quarterback to go on to play for the Texas Longhorns, joining freshman QB Jevan Snead and former QB Vince Young. You can see a video of Brantley talking about his commitment to the Horns complete with highlights here. Just press play on the realplayer console on the front page. Brantley's Celtics will play Clearwater Countryside in it's annual Spring Game tonight. That can be heard on ESPN's WMOP live on the internet starting at 6:00 CST. Here are some highlights from Brantley's junior year at Trinity Catholic High. Thanks to Sunshine Preps for the video. 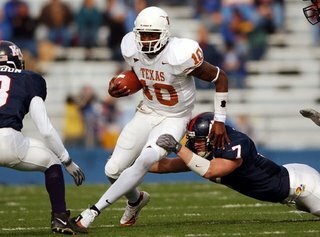 Two days before the 2006 NFL Draft, Vince Young was on ESPN's Draft Special talking about pre-draft rumors, questions about his ability, and how he'll make the transition to the NFL. Trey Wingo opens the piece by saying, "There is one thing you can say about Vince Young with great certainty--there is a wide diversity of opinions about him." After the interview, he says, "One thing you can say about Vince Young without question--he is a solid citizen and a humble man." Now everybody knows... Trey Wingo can't count. The golden child's parents hid him away from the evil pharaoh Okie II, who had set out to slay every Texas-born male child under the age of three. But alas, the prophecy could not be avoided and eighteen years later (to the day) he became a longhorn. I can't find a good link, but that's pretty much exactly how it happened. So to celebrate Vince's first birthday as a millionaire, please enjoy these highlights from his freshmen and sophomore seasons as a Texas Longhorn. Also see The Horns Sound and The Texas Passion. Last night during TNT's Detroit Pistons/Cleveland Cavalers halftime show, Kobe Bryant made an appearance to confront Charles Barkley over his comments about Kobe quitting and his selfishness during the LA Lakers playoff series with the Phoenix Suns. Following a heated text message exchange, Kobe faced the fire and explained his play in the series leaving Barkley with little to say. My favorite Kobe line, "Well I'm not gonna jump over the table and lump him upside the head or nothin like that." Vince Young is gone. But this helps. kinda. For those outside the Austin area, here's a news segment that aired a few days before the 2006 Spring Game. 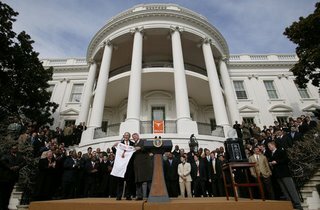 It shows Jordan Shipley making a spectacular catch on a throw from Jevan Snead and Darrell Royal being presented the symbolic national championship trophies commisioned by the Mack Brown and the Texas Longhorn football team.